The photo-sharing market is saturated, and, by and large, we don’t need more players. The players that are there, if they’re not leading, are trying to differentiate themselves from the rest in a host of different ways. In the case of Tracks, while it is, by makeup, a photo-sharing app, CEO Vic Singh says that the startup really isn’t trying to solve a photo-sharing problem so much as its building a service where people can create small networks around shared experiences in the real world. In October, we covered the startup’s launch of its iOS app, which seeks to do just that by leveraging “the experience graph” to allow users to create on-the-go group photo albums, and merge online and offline worlds by allowing users to turn those photos into printable physical photo books, and so on. The idea is really to create unique micro-social networks that revolve around real world experiences. 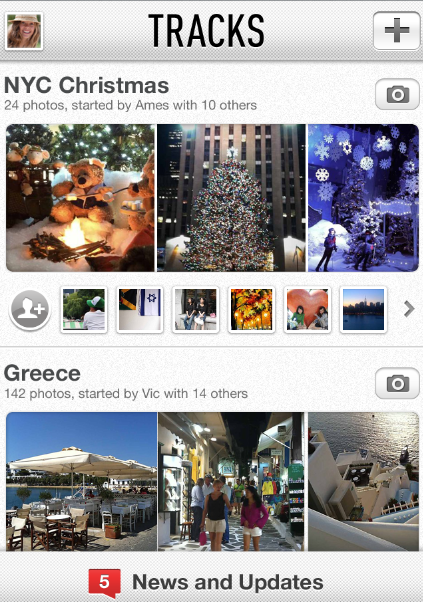 Users can snap pictures, then filter those images automatically in realtime, streaming their “tracks” to iOS devices via airplay, receive news and updates through a feed that presents activity from friends across tracks and networks, as well as geo-tag photos to show where pictures were taken and when — all viewable through an interactive map. “Tracks” are users’ social photo stories, and the Tracks CEO thinks that, rather than basing an app on Facebook Connect and a user’s friend network, users want a more realistic mapping of fluid networks in realtime — thus, “Tracks” are micro-networks that cut across networks that enable users to make and share experiences easily. That being said, apparently Tracks wants to do both. Previously, users had to invite their friends to join a Track, but the team has upgraded its iOS app to to allow friends to join Tracks based on their social graph, rather than just the invite-only model. I’m not necessarily buying another graph, nor am I convinced that Tracks can beat Instagram or a mobile Pinterest, though I think inherently the concept behind Tracks has some power. Making social photo stories is something mobile users inherently want to do in realtime and on-the-go, but the user experience has to be seriously differentiated from the rest. Tracks has some of the best features of the leading photo sharing apps, filters like Instagram, and so on. But does it do it better? Well, more than a couple of investors are willing to bet that it does. Today, the startup has announced that it has raised $1 million in seed funding to go after the mobile experience graph. The investors include General Catalyst, TMT Investments, Eniac Ventures, AppFund, BHV Ventures, Harbor Road Ventures, Atventure.us, and a handful of angels including Photobucket founder Alex Welch, who will be joining the board. It’s a big vote of confidence for the young startup, which launched at TechCrunch Disrupt NYC in May. Not bad for six months. For more, check out Tracks at home here. And chime in to let us know what you think.